Today, we’re reviewing the popular Suncast pet carrier. We’ll take a look to see how it works for people with a range of different small to medium size pets. Finding the best pet carrier is never easy, especially when there’s so much to choose from both online in and instore. The Suncast portable pet crate, however, ticks a lot of boxes if you have a small or medium size dog or a cat. It’s designed for a getting your pet from A to B, whether it’s to the vet or on a much longer trip. With excellent visibility all around, your dog will be able to see clearly and is less likely to get stressed out by being in an enclosed space. If you would rather go to the sales page directly, click on the link below to buy it. CLICK HERE to Read Customer Reviews & Buy the Suncast Carrier on Amazon! The clean design and good size make it a good choice if you are going on any trip. You might be surprised to learn it’s also been used by some parrot owners to provide transport for their feathered friends. Suncast is a favorite pet product company and one which you can undoubtedly trust to deliver exceptional value. Their products are always of high quality and designed with strong and durable materials in mind. If you’re looking for a pet carrier that is built to last, they’re a good company to look out for when narrowing down your choices. They produce a wide range of products, not just those for pets. That includes garden furniture and exciting ideas for home storage. The Suncast portable pet crate measures 23 inches long and 15 inches wide, so there should be more than enough room for most small dogs. The height is 12.5 inches which give you plenty of headroom too. The door, corner section, and base are made from strong and durable plastic in blue and brown. The bars are metal and resistant to dog and cat biting and clawing. The portable pet crate can be dismantled and put together again easily if you need to carry out a full clean. CLICK HERE to Buy a Suncast Pet Carrier on Amazon! Before you decide to buy any pet carrier, you want to make sure it fits your pet. Whether you have a chihuahua, Shih Tzu or another small dog, cat or another animal, you should first measure them from tip to tail. It’s made of hardened plastic resin and is easy to clean. It’s designed for dogs up to 30 pounds in size. All round viewing means you can always see your dog and they can see you. The bars are made from metal and are highly durable. The door is secure and straightforward to open and close. It comes with a letter label sheet so you can personalize the carrier with your pet’s name. There’s a great added extra which comes with your Suncast Pet Crate. A small pet bowl can be clipped inside and used to provide either food or water. This doesn’t take up much room and still allows your animal the space it needs. The handle at the top is comfortable to hold and just in front of this is a small lid. You can lift this up and reach inside to replenish the food bowl if needed or remove it. That means you don’t have to worry about your dog or cat escaping by opening the larger front door. The Suncast 23-Inch Pet Carrier is a product which suits small and medium size dogs and cats of all types. The one thing that owners say about it is that you can’t find a better pet crate at such a low cost. For some reason, the pet carrier doesn’t come with its own mat. This won’t bother most pet owners because they’ll have their own but it might be something for Suncast to take a look at. It’s not, unfortunately, an appropriate crate for carrying your pet on an airline as the door is made of plastic. The stipulation for most flights is that the door needs to be made of metal. It’s also a little too bulky for taking onto the passenger section of a plane. That aside, any long journey means you need to keep your dog or cat comfortable. Put in your dog’s favorite blanket and you have a nice space that will keep them calm as you travel along. 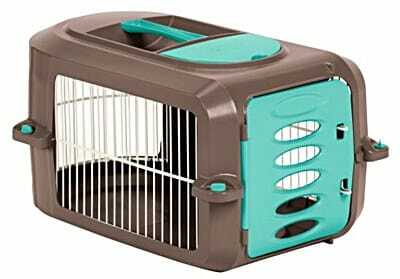 If you would prefer a sturdy soft-sided carrier, a good one to use is the Sherpa Original Deluxe Pet Carrier. Click the link to read our comprehensive review. The good thing about the Suncast Pet Carrier is that it suits a wide range of small animals. That makes it the perfect crate for long journeys and trips to the local vet. It’s undoubtedly one of the best pet carriers for dog breeds such as Bichon Frise, Yorkie, Chihuahua, Shih Tzu, and Maltese. 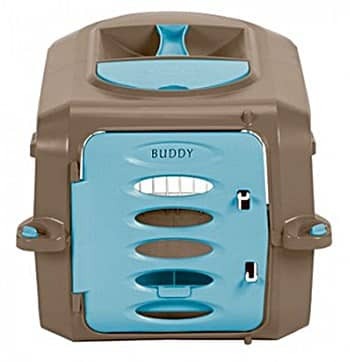 If you’re looking for a roomy carrier for your cat, this is ideal, and the open sides will help keep your pet calm. Many bird owners favor the Suncast Pet Carrier because it’s large enough to hold parakeets and parrots as well as a few toys. The wide door and easy access make this pet crate suitable if you have a nervous animal that is difficult to get into confined spaces. As with any pet crate, getting your dog or cat used to the Suncast is going to be your first job. This is made more straightforward, according to many customers, because of the size of the door opening. Users advise putting the pet crate down in a place where your animal feels comfortable. Leave the pet carrier door open, and hopefully, your dog or cat will soon start to go in and out of their own accord. If they don’t, try putting some treats inside. Ideally, you should begin acclimatizing your pet a couple of weeks before your first big trip out. The top cover is wide enough to get your hand through without opening the main door. Customers say this is useful if you need to give your animal a treat or need to adjust something. The Suncast Portable Pet Crate is large enough to give your small dog or cat plenty of room while small enough to fit on the car seat. This is one of the main reasons why so many users love the model. When transporting your pet using the carrier, you don’t have to worry that the door is suddenly going to open and your pet escape. The pet carrier door locks securely, and the whole crate is light to carry. Many animals like the wide-open space and are more than happy to treat it is a second home. 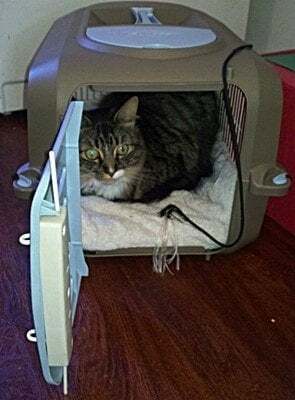 Set your pet carrier in your dog or cat’s favorite location and put a comfy blanket on the inside base and open the door. Instore prices can be pretty high for a good quality pet carrier. When you want to deliver the best for your pet, it’s tempting to pay that extra. The good news about the Suncast is that it’s very affordable and still comes with all the benefits you expect. Most vets will explain that one of the key things in a good carrier is ventilation. Far too many, more costly carriers, have closed sides that can make the crate stuffy. One of the big plusses with the Suncast, according to customers, is that it is open on all sides. Your pet will have plenty of air circulating, whatever the weather. That’s important if you are traveling somewhere in a car. You don’t have to compromise on the sturdiness of the design either. 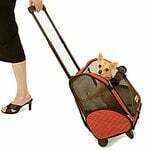 Other pet carriers on the market tend to have flimsy plastic and can be less suited to animals such as dogs. There’s no such problem with the Suncast Portable Pet Crate – it’s made of really durable and solid resin plastic. As you might expect with a well-known brand like Suncast, there are plenty of happy customers out there. One of the positives is the excellent price. Pets can cost enough on their own without having to fork out for high priced carriers. If you have a long journey ahead, of course, you want a pet carrier that has plenty of room. Reviewers have spoken about taking 900-mile trips quite safely with the help of the Suncast pet carrier. This is certainly a carrier that can be used in a wide range of circumstances. You may want it to travel from one side of the States to the other. Perhaps you need to get your cat or dog safely to the vet. The size of the pet crate means that you should have plenty of room for your small dog or cat. There’s even enough space to fit a pet bowl when you’re on a longer journey. This clips in and out giving you a good deal of versatility. Finally, the Suncast Pet Carrier is easier to clean than other products on the market if your pet has a little accident. You can also personalize the front door with the adhesive letter labels that are provided free in the box. All in all, it’s a modern pet carrier that ticks most of the boxes. CLICK HERE to Buy the Suncast Pet Carrier on Amazon!